When it comes to interior designs, there is nothing more liberating than the freedom to design everything to work together in a materially and visually coherent way. Unfortunately, in real life we are rarely afforded this kind of design luxury – but in the virtual world anything is possible. 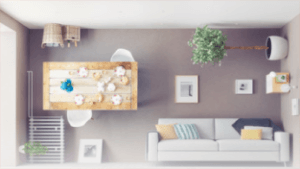 These virtual dining room interiors are downloadable modifications for simulated living, with modernist lines that are part design choice and part byproduct of the world for which they are designed. The colors are set to match one another – from the walls and furnishings to furniture and fixtures – as few real-world designs can manage to do.